A "selfie" is not a headshot. 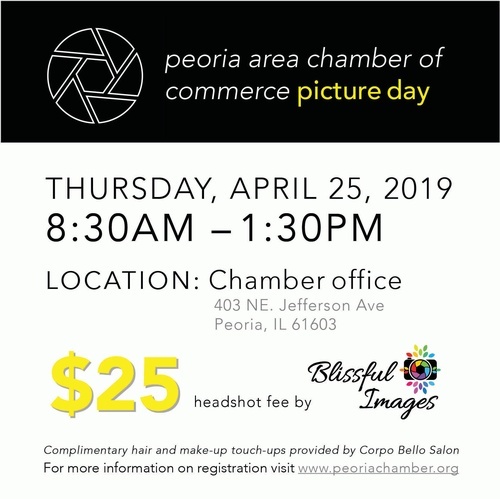 The Peoria Area Chamber of Commerce is hosting "Picture Day" on Thursday, April 25, 2019 at the Chamber offices. Blissful Images, will be taking professional headshots to place on business cards, use in your online presence and more! The $25 fee includes professional sitting fee for the head shot and a digital copy of your photo. When registering please select the 15 minute time slot you wish to come into the Chamber offices and take your portrait. You will receive an email confirming your photo time on Monday, April 22, 2019. Corpo Bello Salon will be providing last minute hair and makeup touch ups!